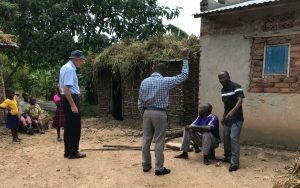 In November 2016 Dr Maureen Wilkinson went with staff from Kagando hospital, to meet James, a young man with a long term mental health condition that had remained untreated for a number of years. Maureen was able to make a diagnosis for James and treatment was begun. In October, 2017 Hugh Burgess and John Taylor (respectively the Chair and Treasurer of Jamie’s Fund) were privileged to meet James at his home. 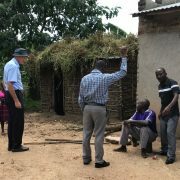 They are delighted to report that James has continued to make good progress thanks to regular treatment given by Kagando Hospital with the on-going support of Jamie’s Fund. For many years James had had to be restrained and so it was wonderful for John and Hugh to see him now walking free and able to take an active part in the consultation with the medical team. Having seen this work at first hand, Hugh and John are very pleased that a few thousand pounds provided by Jamies Fund is able to make such a significant difference in the life of James and others who would otherwise have very little hope. We are delighted to be partnering with Kagando Hospital in this work.